“Kateri Tekakwitha was born in today’s New York state in sixteen fifty-six to a Mohawk father and a Christian Algonquin mother who gave to her a sense of the living God. She was baptized at twenty years of age and, to escape persecution, she took refuge in Saint Francis Xavier Mission near Montreal. Kateri impresses us by the action of grace in her life in spite of the absence of external help and by the courage of her vocation, so unusual in her culture. In her, faith and culture enrich each other! May her example help us to live where we are, loving Jesus without denying who we are. Saint Kateri, Protectress of Canada and the first native American saint, we Entrust to you the renewal of the faith in the first nations and in all of North America! She died as she lived, ‘as a Saint’. 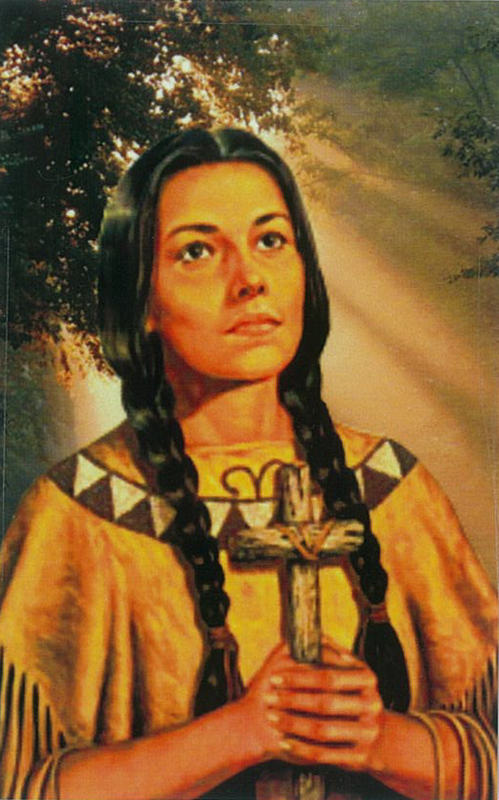 The ‘Cross’ of ‘Jesus Christ’ was the focus of Saint Kateri Tekakwitha’s life, of her journey with God and to God. Yes, St-Kateri was very focused in her desire and her zeal to be holy; her short-lived life showed it, her death showed it and her many miracles prove it. She has been and will be a great model for people striving to become saints. I, for one will certainly be invoking her help in my walk on the ‘narrow road’. I did not know about Blessed Kateri until my friend, ‘Rose Nadeau’, suggested me as a speaker for a ‘Kateri Day’ conference. While pursuing my research on Blessed Kateri I was deeply touched by this ‘Lily of the Mohawks’, this ‘Lily Among Thorns’. Her profound seriousness in the living out of her new Catholic faith deeply moved me. On the day of her Canonization, October 21, 2012, I was privileged to join a group of pilgrims who attended a Mass of celebration of the ‘Canonization of Saint Kateri Tekakwitha’ at the Blessed Kateri Tekakwitha Shrine (Mission Saint Francois-Xavier) at Kahnawake, near Montreal, Quebec, Canada. I felt so blessed and was so thankful to God for taking me there, where Saint Kateri spent the last years of her short life and where she walked and prayed and lived her holy life. I later visited the museum and prayed at her tomb located in the church asking her to help me ‘strive for Heaven’. Matthew Bunson describes her love of the rosary and devotion to Mary in this way: “She always had the rosary with her. She walked always with a rosary in her hand so as not to allow her time going about the camp to be spent outside of some form of prayer. “Every morning, winter and summer, she was in our church at four o’clock, and often she arrived even before the bell which rings every day at that hour. She remained there several hours in succession in prayer, though her tongue played small part in it. Ordinarily, she prayed only with eyes and heart—her eyes suffused with tears, and her heart incessantly giving forth ardent sighs. She was always as if lifted out of herself when she prayed and conversed with our Lord. It was this steady flow of persecution that prompted Father James de Lamberville to have Kateri move up north to Canada and join the Mohawk Christian settlement at Sault Saint Francis Xavier at Kahnawake, near Montreal, Quebec, Canada. It was here that she lived the last short years of her life in a Christian community. It was here that she also took her vows to live as a ‘Bride of Christ’. There is so much more I could write about this extraordinary saint, who so loved the ‘Cross of Jesus Christ’ and who so loved to pray. If you have a sincere desire to be holy, to become a ‘saint’, then, I invite you to read some of the books I have listed here below and watch some videos, and journey with our new saint, ‘Saint Kateri Tekakwitha’. It will be the best investment of your time, ever. Bunson, Matthew and Margaret, “Saint Kateri. Lily of the Mohawks”, Our Sunday Visitor, 2012. Bonaparte, Darren, “A Lily Among The Thorns: The Mohawk Repatriation of Kateri Tekakwitha”, Wampum Chronicles, 2009.
www.alleluiaaudiobooks.com/st-kateri-tekakwitha-NoahMoerbeek, Nov 5, 2012 . Per Donald Andre Bruneau, Ottawa, Ontario, Canada. Hello, I found this picture of St. Kateri Tekakwitha on your web site. May I have permission to use for an upcoming parish calendar?